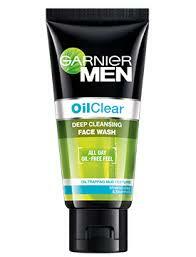 Garnier Men Oil Clear Deep Cleansing Face Wash Review 2018 - In today's article we are gonna discuss the Garnier Men Oil Clear Deep Cleansing Face Wash as this is discussed by a lot of people. This Garnier's facewash is specially made for the guys having oil and pimple prone skin. The main reason for getting a lot of pimples in oil-prone skin due to extra secretion of sebum. This sebum attracts a lot of bacteria and dust which damages your skin slowly. In today's world, everyone is scared of pimples and acne and especially for guys from the age 17-30 and most of the guys are having oily skin which makes the frequency of occurrence of a pimple even more due to dust and bacterias. That's why you should cleanse your face at least 2-3 times a day and especially for boys as they are not much cared about their skin and they are too casual regarding their skin and they realized when they used to get a lot of pimples and dark spots. For washing your face, there is plenty of facewash available in the market but today's review is about Garnier men oil deep cleansing face wash, so let's talk about it in detail. I am using this facewash from the past 30-40 days and really its effects are great. If you are someone who is having oily prone skin and who is really annoyed with the pimples then this is one the facewash which you must give a try at least. The covering of the product is hard as usual which is provided by Garnier and the fragrance of the facewash is too refreshing and gentle which makes it more beautiful. It contains absorbing mineral clay and Cyro-menthol which is used for cooling your skin and removing excess oil from your face. The face wash is also formulated with cooling menthol which cools and also nourishes your skin easily and which helps oil control on your oily skin. It really soothes the skin and also provides coolness in the skin. Using this face wash is too easy-This Garnier men’s face wash comes in an easy-to-use compact tube. Simply flip open the cap, squeeze the desired amount of face wash on your palm, apply it on wet face, massage with your fingers for the next 1-2 minutes gently and rinse off your face with clean water. Pimples in the age of 16-22 age are very common due to hormonal changes in the body. But a pimple, acne can't be taken lightly as it can be a major issue in the future and therefore its care should be taken. The extra sebum which generates in your face is the major factor of your pimples and this has to be stopped somehow and in this, the Garnier oil deep cleansing face wash will definitely help you out. Pimples and their dark spots take out all your face's charm and make your face duller and which makes your personality dull. The texture of the face wash is a little thick and its fragrance is mind refreshing and it really removes all the excess oil from your face and it is done only because of the menthol present in the face wash.
Garnier Men's Oil Clear Deep Cleansing face wash designed to remove dust & pollution from the face. Regular usage makes the skin looking refreshed and clean. Cleanses Skin Deeply, removing oil, dirt and pollution. Skin Looks More Even, radiant and feels fresh all day. Cheaper as compared to other face washes. Removes excess oil from the face and makes the face oil free for more than 3 hours. The skin remains oil free not more than 4 hours. No whitening effect on face. Here we have discussed about garnier men oil clear deep cleansing face wash,its pros and cons and presented an indepth review of garnier men oil clear deep cleansing face wash.After using it for while and by customer reviews,this product is well appreciated and it really works if you use it daily atleast twice a day and its major work is to remove the excess oil from your face so that the production of pimples get stopped.I'll recommend you to definately try it once as it working very well.This product can be easily used by the men and definately it will help you all in reduction of oil from your face.